“Bikefit” at Star Physio is the process of professionally fitting a bicycle to its rider using the assessment and intervention skills of a physiotherapist with specific expertise in cycling and its biomechanics. Combined with the most high tech bikefitting equipment in the world from our German Partner Gebiomized, this ensures ideal positioning that maximises each rider’s athletic input while minimising impact on vulnerable parts of the body and reducing the risk of injury. For cyclists in pain or discomfort, we diagnose the issue and identify potential causes and faults related to cycling position or technique. Research in recent years has shown that long used bikefit techniques such as side on knee angle and fore-aft position relative to the pedal spindle (KOPS) are either inaccurate or have no scientific basis at all. This is why Star Physio use saddle stability and pressure analysis in every bikefit to determine the optimum cycling position for each client. 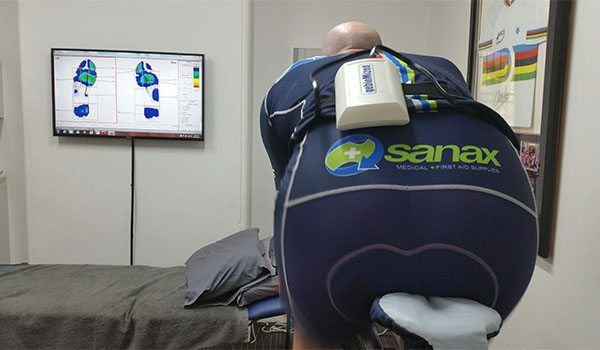 We are the only physiotherapists in Australia and the only bikefitters in Western Australia to use this technology which is widely regarded as the “gold standard” in bikefitting internationally. More and more of the best cyclists and triathletes in the world trust Gebiomized Technology in expert hands for their bikefit including Orica Green-Edge, Team GB and Sky Team, Team Germany, Team Canada and world champion triathletes Patrick Lange and Jan Frodeno. Patrick Lange World Ironman Champion uses Gebiomized Technology for bikefit. 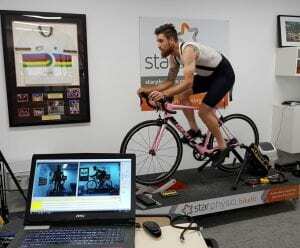 If you truly want the best bikefit available, trust the experts at Star Physio today and get in touch to see how we can get you in the best possible cycling position with accurate and valid technology. Stop guessing and wasting your money on outdated technology and disproven methods! All “Bikefit” extended physiotherapy consultation services at Star Physio include comprehensive physiotherapy assessment and intervention in the form of biomechanically appropriate adjustment of your bike, as well as advice and exercises to assist with reducing or preventing pain while cycling and allowing you to continue to exercise to stay fit and healthy. These are an important part of our physiotherapy service and our ongoing goals of assisting clients in pain and allowing lifetime exercise to live a long and healthy life. As such, all of our “bikefit” physiotherapy consultations attract private health fund rebates. At Star Physio, our “Bikefit” is conducted during a physiotherapy consultation of between 80 minutes and 2 1/2 hours depending on the complexity and details required.Check out our http://starphysiowa.com.au/bikefit-services/ page for more information on the types of physiotherapy “bikefit” services we have available, and what to expect during the appointment. Did you know that the number one risk factor for early morbidity and significant disease is low fitness? Physiotherapists are experts in both treatment and prevention of injuries, but now more than ever we are ideally placed to assist clients in achieving and maintaining good levels of fitness, through recommending appropriate exercise. Cycling is a fantastic, low impact form of exercise, that can be used at almost any age and any level of fitness for weight loss, fitness, commuting or as a competitive sport. However research by Wilber (1995) stated that 85% of cyclists will get injured! Dettori in his 2006 paper identified the main areas of pain in cyclists as the Knee (20-65%), Low back (15-50%), Neck & shoulder (10-50%), Handlebar palsy (10-70%), ‘Saddle sores’ (40-65%) and Numbness & Erectile Dysfunction (20-60%). These numbers are quite frightening which is why you should get on top of any niggles early and prevent these injuries where possible by trusting one of Star Physio’s expert physiotherapists to get your bike in the ideal position for you as well as provide advice to help achieve your goals. Cycling is a unique sport in that the rider is attached to the bike at 5 contact points- two hands on the bars, at the seat, and via two feet clipped in to pedals at the end of crank arms where the cyclist propels the bike via the lever arms, but also where the crank arm pushes the knee towards the chest at the top of the pedal stroke (via hip flexion) while the hip and spine are fixed via bodyweight on the saddle. This movement typically happens 80-100 times per minute in road cyclists. Our physiotherapists have the skills to alter the load on particular joints/ parts of the body via the adjustability of the bike and shoe cleats, and we can work with you to improve your ability to tolerate the load of cycling via treatment and specific exercises to assist with pain relief, increased movement or strength, or general fitness and performance.. The literature and research relating cycling, bike position and injuries is poor, and Star Physio and our colleagues both locally and internationally are working at rectifying this situation. Our first research was presented at the Sports Medicine Australia Conference in Melbourne in November 2016. This showed significant reduction in pain in cyclists following a bikefit with a Physiotherapist. We hope to see this research published in an international journal this year to further the understanding within our profession of the relationship between a cyclist and the bike, and well as the important role a suitably trained physiotherapist can play in assisting cyclists in pain. Our findings in this research were no surprise to us as we have been successfully assisting patients with pain while cycling by adjusting their position on the bike for over 15 years. In the last five years, we have performed more than 2500 extended physiotherapy consultations with the primary physiotherapy intervention being adjusting the bike or “bikefit”. Our professional fit is achieved with the help of world leading, state-of-the-art technology. Star Physio is the only physiotherapy clinic in Australia to offer dynamic pressure analysis at the saddle and feet alongside high speed video technology- with twice the frame rate of Retul and BG Fit systems for greater accuracy, which allows our physiotherapists to interpret high quality data and combine this with information from your assessment to find an ideal position for you. Throughout the fitting service, we use high speed motion capture video analysis to view your positioning and compare adjustments made. This combined with our physiotherapy tools, ensure all measurements are accurate. After your bike fitting service, you’ll receive before and after pictures of your fit as well as the appropriate measurements and recommendations to maximise your cycling experience..